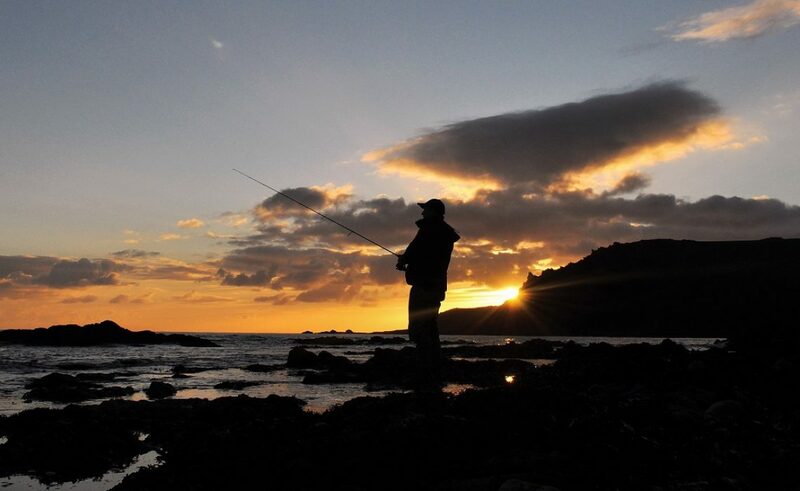 Ask any fisherman what their ‘ultimate aim or goal is’ and I’d say you’ll receive a multitude of answers ranging from ‘becoming a better angler’ to ‘just being out on the coastline or river’. However, I’d hazard a guess that beating their personal best of a particular species is also right up there! The previous day, one of my clients (Johnny) had landed a beauty of 59cm (5lb) on a large surface lure. A I mentioned in that blog post here, there had been a great deal of bait fish activity all along the coastline, which the bass were feeding on avidly. Moreover, the sea conditions on that day were quite lively which made for excellent conditions. So with the onshore wind forecast to increase slightly overnight, the associated waves/swell were also likely build, but crucially, I believed the water would still be clear enough of floating weed and silt on a mark where I’ve been successful in the past. Reading through my notes, the ebb tide on this mark appeared to be more productive than the flood, and with a with a 5.1m high tide occurring at 0843 (Salcombe scale) I was severely tempted to head out. But there was a problem or two, or more a couple of inconveniences! I had a multitude of chores to complete that day and it was also forecast to pee it down! Transferring my lure gear from the garage to the car, I still unsure as to whether I was actually going to go fishing! Duly dropping my Daughter off at school, I sat there for a further 5 minutes, watching the clouds darken, before deciding what to do… I just had that feeling though… Something was telling me to go for it! So I did! I worked out that I had approximately 2 hours to fish, essentially over the 3rd and 4th hours of the ebbing spring tide. The area I’d chosen would see crossing shingle/sandy gullies as the water levels dropped and fishing from rocks at least double the height of any expected waves. Whenever I’m fishing alone I will always wear my Air Flow Wave Hopper Inflatable Fly/Flotation Vest, and knowing the weather conditions weren’t going to make for an overly pleasurable experience I was actually glad to have another layer above my jacket! When weather systems are due to arrive from the south-west, the Met Office are remarkably good at forecasting exactly when the rain will start… Right on cue, as I pulled on my waders at 1030 the heavens opened… bugger. As expected, although the wind was blowing straight onshore at around 20 – 25mph it hadn’t quite ‘roughed up’ the sea to the extent of ‘murking it up’ – not exactly technical terms granted. But to a bass lure fisherman the conditions looked bloody wonderful! With around 18″ of water clarity, plenty of white aerated water being smashed around the rocks, and that lovely greenish hue to the sea – I couldn’t wait to make the first cast and retrieve. The elements and the occasion warranted a special lure, and most importantly, one up to the job of coping with 4 – 5ft waves/swell and the strong winds. Attaching my favourite Daiwa Shoreline Shiner Z120F Vertice lure, I was praying that there wouldn’t be too much in the way of floating weed to hamper my retrieves back through a delightful gully filled with foaming, frenzied water. My heart was well and truly pumping with anticipation and excitement in what were wild, yet invigorating conditions. The work of art that is the Daiwa Shoreline Shiner Z120F Vertice. They cast brilliantly and catch lots catch bass – unfortunately they also bring a tear to your when you lose them!! With the water levels quickly dropping I waded across a small gully (shingle/rocky seabed) to a large ‘island’ of rock. The outer edge was getting pummelled by the larger waves therefore, erring on the side of caution, I remained further back whilst still being able to cast into and work a lure through what I hoped would be ‘bass central’. It just ‘smelt’ of bass out there and it was just fantastic to be out on my own for a change – I don’t mind admitting it! With 30 minutes or so of the session remaining I was up against it. But I’d saved what I considered as the best until last… This mark has been really consistent over the years and has yielded bass in a variety of situations ranging from sunny and flat calm, to dull and rough as rats – like today. Indeed, it is the way the waves are forced through a gully adjacent to another large ‘island type rock’ that makes this mark so appealing, but with one caveat – a very long cast (40 metres) is required to reach what I consider as the ‘hotspot’. With a brand new Shoreline Shiner attached, I’d made four casts into the zone, but none of them had quite reached the required spot – an underwater rock precisely in the entrance to the gully mentioned. I can just image bass lying there waiting for food items to be swished into their path – small fish perhaps, completely disoriented by the sheer volume of water that is swirling around them. This was it. I was drenched and I really had to get back so I prepared to make my last cast of the session. Taking advantage of a momentary lull in the wind, I slowed the compression of the rod right down, attempted to lower the trajectory of the cast and proceeded to really ‘punch’ it through the headwind… Perfect. The lure plopped on the surface the desired 40 metres out, and I’d turned the handle of the small spinning reel only once when the rod was positively yanked downwards with a WALLOP! Before I even knew what was happening the fish was taking line against a very tight drag! A few slow ‘thuds’ reverberated down the line and transmitted through the rod to my wrists and hands – this felt very, very decent! The ‘Skyroad’ is a fairly powerful rod, certainly compared to the sublime Slash Lamya Thief that I was using earlier in the season. I’d purchased this rod whilst dreaming of moments like this – surf, wind and a big bass attached! Wow! With its dorsal and tail fins (and it’s entire back) above the surface, even in the melee before me, and at such long-range, I could see it was a very big bass. Very dark, and very broad, it looked like a log! Realising I was connected to my PB, this was the moment when I needed to keep my head (rather than losing it in the moment) by winding like crazy with the rod stretched out as far to my left as possible. Why? There were five separate fingers of rock to my right, all between me and the bass, and the waves were pounding through from my left! Despite losing sight of the fish, astonishingly (when I consider and replay again it now) I somehow managed to steer the bass to within 8 -10 metres of my stance where it surfaced – angrily shaking its head. I saw the fish up close for the first time, and I suspect it saw me too given the way it dived for the bottom once it was only 5 metres away from me. I felt like I was in control of the battle when the bass next surfaced. I could see the hook hold-which looked about as firm as it gets, neatly in the side of the bass’s mouth/scissors and the another treble secured inside its mouth. This was when I became confident I’d land this beast, but first I would need to navigate its passage through a narrow (1.5 metres) gap in the rocks – which I managed first time with the aim to manoeuvre it up onto a small platform just behind me on the next wave. I looked to check the wave situation… Was I good to go? Was I heck! Just when I really need a brief lull there were three larger waves about to move through in the next 20 – 30 seconds. If I got this wrong I would most certainly lose the fish therefore, I gambled! Loosening the drag, the bass sensed a reduction in the tension of the line and decided to power (very, very luckily for me) back through the same narrow gap out into a deeper pool of water. It dived down again, which was probably a good thing as the waves moved through… I’d kept enough tension to maintain control, but not too much that the hooks could pull while the undertow and backwash of the waves crashed through. Right, time to get this beauty in! The bass was clearly tiring therefore, I tightening the drag again slightly and drew the fish closer to ‘that gap’. Through she went without a hitch (an 8′ 6″ rod is perfect for this kind of thing – not too short or indeed, too long) and with a gentle wash onto the platform she was mine! Get in!!!!!!!!! People probably heard me up on the cliff tops! Lucky really, that there wasn’t anyone about – but then who would be (apart from a mad fisherman) on a miserable morning like this! What a fish! The word stunning is used a lot, but I truly was stunned at: a) I’d managed to land it and b) how beautiful she was. The only blemish was a slightly torn dorsal fin that you can make out in the photographs below. Utilising the Bass Anglers’ Sportfishing Society’s (BASS) measurement chart here at 73cm, this bass, in all probability, weighed in the region 9lb. A special moment! And to think I very nearly didn’t bother on such a grotty old day! The 10 second timer on a camera is the best invention ever! It’s difficult to take a decent picture when you’re shaking with excitement but I really did try to do the fish justice. Now I want a ‘double’ more than ever! Pity I didn’t have my Go-Pro with me as it was another lovely moment watching her swim away. Lowering this majestic fish into a nearby pool, I felt it crunch my thumb twice as if to say “I hope you’re putting me back” before shaking its head, tail and body – she was OK to be returned. Finding a tiny inlet amongst the rocks, I lowered her into the water ready for the next wash of the swell, that was receding slightly now that the worst of the rain and wind had blown through. Powerfully, she swam away with the outgoing wash of a wave. It was a pity I’d forgotten my Go-Pro, but I’d managed to record the moment so I was very happy. Clearly, by now I’d forgotten all about my list of jobs including the weekly food shop that subsequently wasn’t completed – boy did I get it in the neck! But it was worth taking my time to scramble back across the rocks (with ‘jelly legs’) and then sit on the shingle as sky brightened, in order to take in the moment and reflect on what I’d achieved. To think, I wasn’t even planning on going fishing originally, and it was the final cast of the day that resulted in such a memorable fish! Sometimes you’ve just got to trust your instincts, apply the hard-earned knowledge you’ve attained and ultimately place faith in your own abilities. Next up for me? 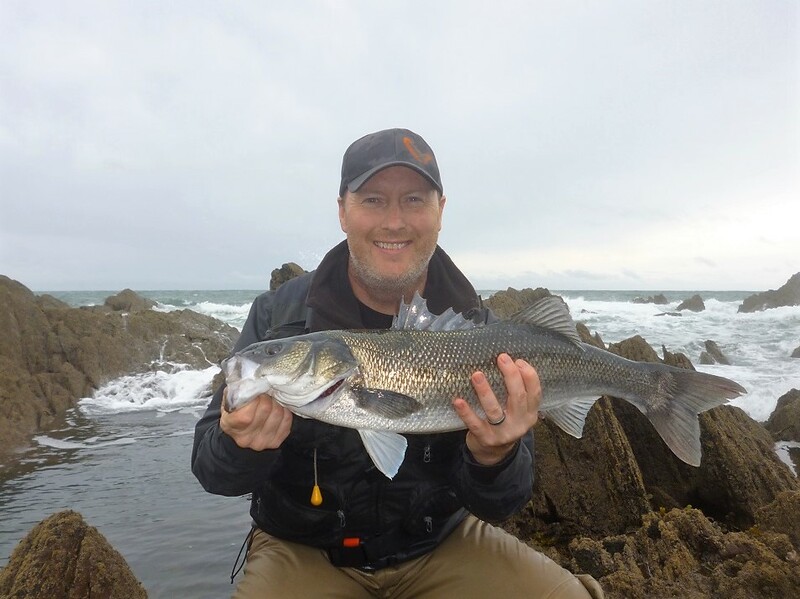 The holy grail of course – a double figure bass, on a lure, from the shore! Previous Client Catches – Patterns in habits and behaviour are key! Next Client Catches – Moonlight, bites and bass!